Applied Psychology in Criminal Justice is an interdisciplinary, peer-reviewed, academic journal that examines the intersection of applied and social psychology with criminal justice. APCJ is an international electronic and print journal published in the Spring and Fall of each year. All peer-reviewed articles must meet rigorous standards and can represent a broad range of substantive topics, theoretical orientations, empirical methods, and analytic strategies. APCJ welcomes submissions that explore the social and psychological aspects of human behavior as related to applied societal and criminal justice settings. 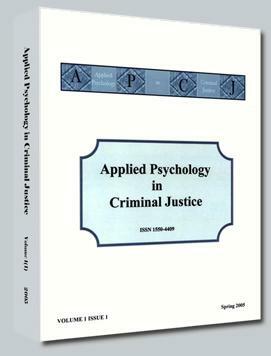 APCJ takes a broad and inclusive view of applied psychology and the study of criminal justice. Select the "Current Issue" or "Previous Issues " sections to view abstracts, articles, and journal issues. Authors interested in submitting an article for publication in APCJ, should complete the Submission Form in the Submit Article section. For a detailed description of submission requirements see our Submission Criteria in the Author Info section. APCJ welcomes submissions that explore the social and psychological aspects of human behavior as related to applied societal and criminal justice settings. Because APCJ takes a broad and inclusive view of the study of both psychology and criminal justice, this publication outlet is suitable for a wide variety of interests. Appropriate submissions could include general survey research, attitudinal measures, research in which criminal justice practitioners are participants, investigations into broad societal issues, or any number of empirical approaches that fit within the general umbrella provided by the journal. Authors are invited to submit their work at any time throughout the year and should carefully review the submission criteria and requirements. APCJ maintains rigorous peer-reviewed standards. If you have a submission that you believe meets our criteria, we encourage you to consider APCJ as an outlet for your academic research.